Fun Design: This 100 pieces assorted colorful self-ink stamp set is specially designed with fully loaded ink. Worry free of running out of ink when you want to explore something new. Educational Purpose: By trying out different colorful and vivid patterns of animals and fruit, kids are allowed to develop better color recognition skills and enhance creativity. Multiple Uses: This super fun set can not only be played by kids, but it can also be used by teachers to stamp homework and school prizes. Kids can use these stamps to create their own unique paintings while learning more vocabularies. Ideal Gift: These assorted stampers are the perfect gift choice for kids who are interested in drawing, coloring, animals, and fruit. 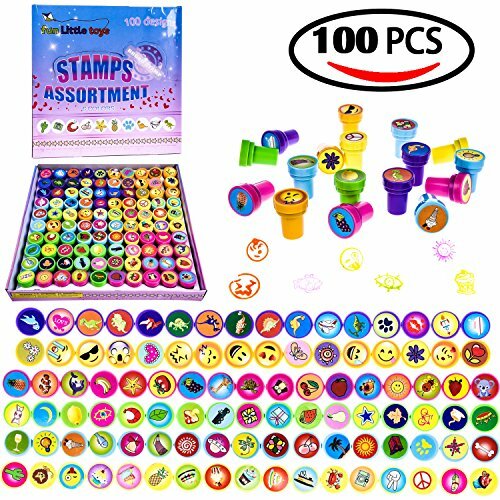 Every child will guarantee to find his/her favorite stamp from this 100 pieces set. Enjoy the fun of DIY!